We don’t spend loads of time travelling in the car. We mainly go to our monthly pug meets and then of course vet visits. But I have a huge concern with safe car travel for pugs. For many reasons too. I’ve always had one of those seatbelt tethers that clip into the seatbelt buckle and then on to the dogs collar or harness. When I got Ref as a puppy, I had a car crate but he hated being in it so I used one of those seatbelt tethers for him instead. He would wear a harness and have the seatbelt tether attached. We really didn’t go in the car that much cause back then I didn’t have my drivers license. But when we did, he would always stand up looking out the window. Once I got my drivers license, we started going out in the car more and I was scared of what could happen to Ref with just the seatbelt tether if we were in an accident on the highway doing 100 to 110km/hr. 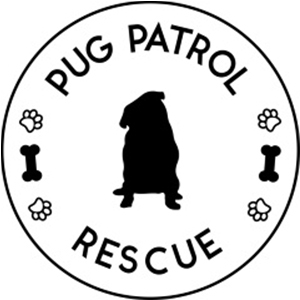 I started researching safe car travel for pugs and discovered a few things. The first was, in the state of NSW where I live, if you are travelling in the car with a dog that is unrestrained, you will be fined $150 on the spot. And if you are in a car accident where your dog is unstrained and injured, you will be fined upto $5000 plus face upto 12 months in prison. That alone is kind of a big deal. 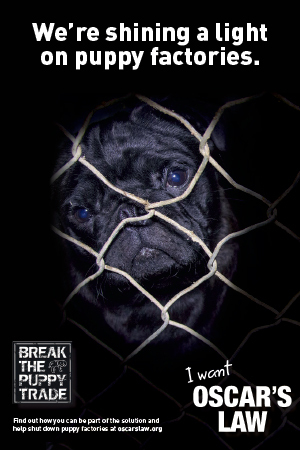 So if your pugs safety isn’t in your mind then the legal side of things should be. 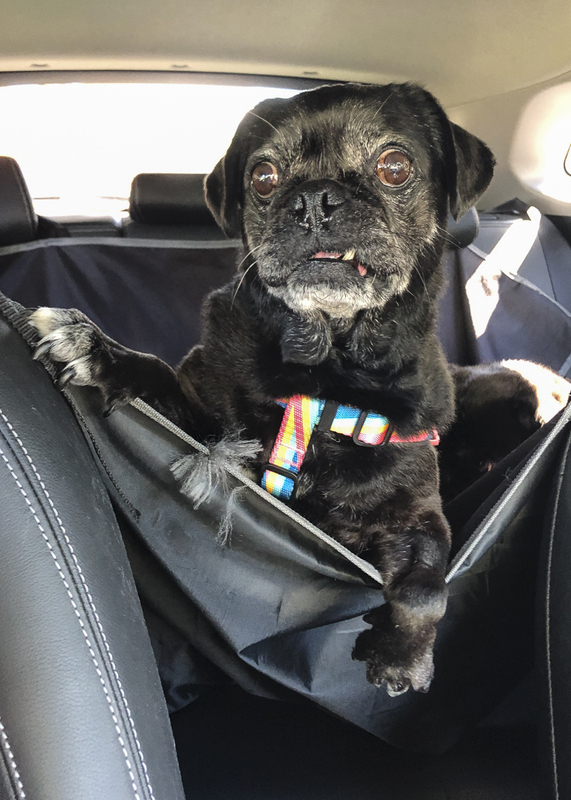 The second thing I learnt was that at that time, there were a total of 2 safe options to restrain your pug in the car if you weren’t using crates. There are hundreds of products on the market to restrain dogs in cars and only 2 were tested as being safe. How frickin scary is that? Both of these options are harnesses. I don’t remember what the first was but it was well over $100 to buy. The second was the PetLife Purina Roadie Harness. It was just $40 too. It was the best investment I made for Ref. The Purina PetLife Roadie Harness not only kept Ref safe, it taught him to sit calmly in the car. He is now the most chilled dog when it comes to travelling in the car. So the first thing on my shopping list once I got Serina was another Roadie Harness. 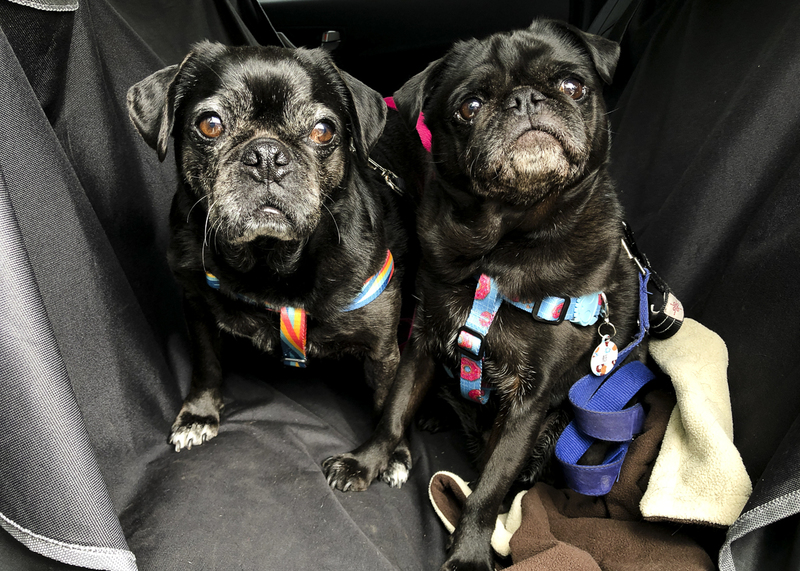 I wanted to make sure that both of my pugs would be safe whilst we were in the car. I thought it would be nice and simple like it was with Ref. Boy was I wrong. Serina is a completely different dog. I had to be so aware of her anxiety. I didn’t want to freak her out especially travelling in the car. We started Serina’s car journeys with just the seatbelt tether. She was pretty relaxed initially but in hindsight, I think she was more uneasy so she stayed still. I got her a Roadie Harness but I’ve never been able to successfully use it with her. She freaks out wearing and gets tangled in the seatbelt. Travelling in the car with Serina has never been that easy, except for the road trips where I was sitting in the back of the car with her. 2.5 years on and I still have to use the seatbelt tether. I also had to put in a pet hammock to prevent her from trying to climb through to the front of the car. She is progressively getting worse in the car. She isn’t calm. She won’t sit still for longer than 5 minutes. She launches herself forward so she is looking over the hammock at me. I don’t know whether she can’t contain her excitement for going out or if she is stressed because she can’t be with me as I’m driving. I’m at a loss at how to keep her safe whilst in the car, how to keep her calm. All I want is to be able to use the Roadie Harness with her so I have peace of mind when we are in the car. I’m planning a 2 week long road trip with my mum and the pugs to outback NSW. My biggest problem right now is that Serina won’t be calm for the entire road trip and with spending anywhere from 4-10 hours in the car on any given day, I need to get her calm. I need to have her safe. I’d never forgive myself if something happened to her in the car. So I’m embarking on a journey to get her calm in the car. And without the use of meds from a vet. It’s going to take some time and training but with the help of some wondeful ladies at Two Oily Ems, some essential oils and some wrapping, I’m hoping to have a calm Serina in the car in no time. 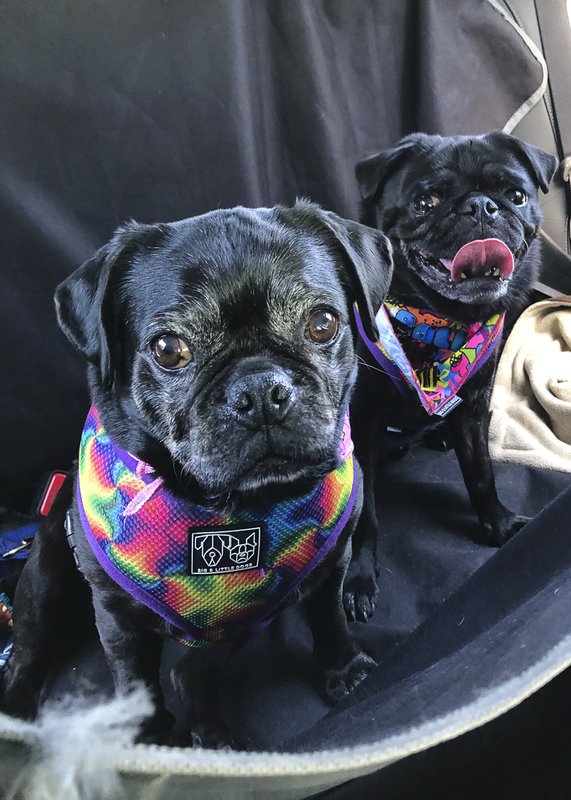 I’ll keep you posted on my goal to have safe car travel for pugs in full swing for both of my pugs. 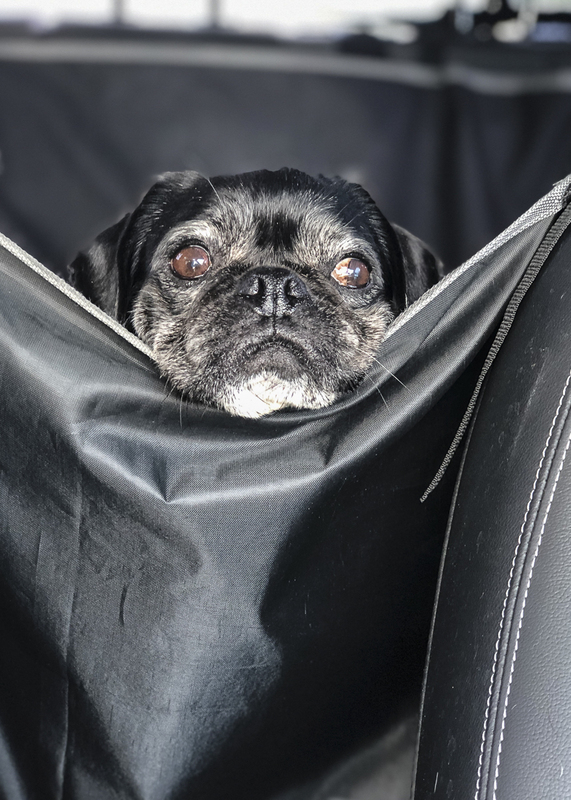 What safe car travel for pugs tips and tricks do you have? Share them below in the comments. It may be very $ to have it sent, but look into the PupSaver. http://www.pupsaver.com…it is rear facing and crash tested. I don’t think Serina would cope well with not being able to see me. I’ve never thought about the legal aspects. I normally only have one of the pugs with me at a time right now. Mainly just for vet visits. That pug will usually get the front seat. I have one, Mayline, who is incredibly anxious and she practically strangles herself with the harness and seat belt tether. She wiggles so much I’m sure she’s going to get out of it one of these days. I wish you luck in getting Serina calmed down enough for a long road trip. Maybe if you sat in back with her? I don’t think a lot of people think about the legal side though the safety side is far more important to consider. Perhaps you could try a thunder shirt or a wrap like the one I’m using with Serina along with Lavender to help Mayline to be calmer in the car too. Where would I buy a Roadie Harness? If you are in Australia, try Pet Barn or another major pet store. If you are not in Australia, try Amazon though I don’t know if it is sold outside of Australia. It’s full name is Purina PetLife Roadie Harness.